The Tour de France challenges world class athletes in a manner that few other events can. In order to show just what it takes to ride in the Tour, we’ve taken power files from several riders and analyzed their data. Take a look at our analysis, or learn how to analyze a Tour file and perform your own. These files give insight in to how many calories they burn, how many watts they push up the massive climbs, just how fast they ride and answers the question; just how hard is the Tour de France? View Rogers’ full file here. After averaging 444 watts, 6.09w/kg. 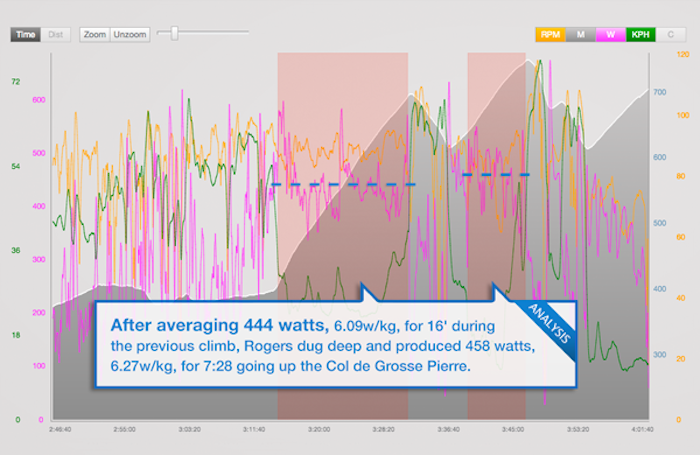 for 16 minutes during the previous climb, Rogers dug deep and produced 458 watts, 6.27w/kg. for 7:28 going up the Col de Grosse Pierre. During the Col de la Croix Moinats, Rogers averaged 88 rpm’s to produce his massive effort over 16′ minutes. On the next climb, his rpm’s dropped to 82 rpm’s over 7:28. It’s not just during the climbs that Rogers had to go hard. In the 30 minutes leading up to the first climb, Rogers had a Normalized Power® of 336, or 4.03w/kg. That produced an average speed of 49.5kmh (31mph). View Nieve’s full file here. The race started early today. 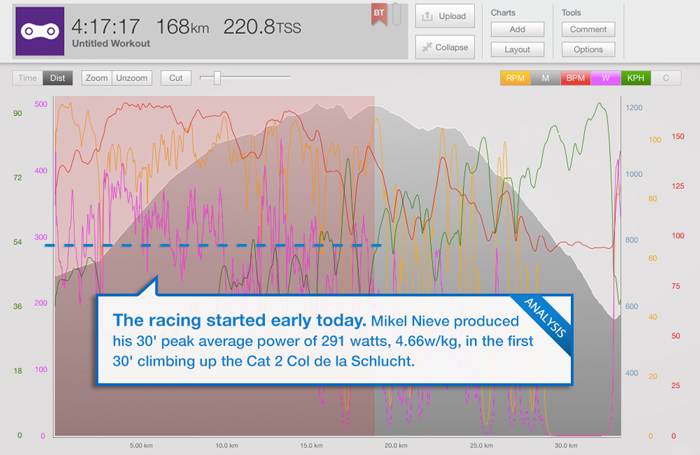 Mikel Nieve produced his 30 minute peak average power of 291 watts, 4.66w/kg. in the first 30 minutes climbing up the Cat 2 Col de la Schulcht. Nive continued to work throughout the day. His peak 1 hour average power of 250 watts, 4.00w/kg. was set during the lead up to and climb up the Cat 1 Le Markenstein climb, which occurred later in stage. Big climbs mean fast descents and Nieve topped out at 95.2kph (59mph). View Durbridge’s full file here. Riding up the first two Cat. 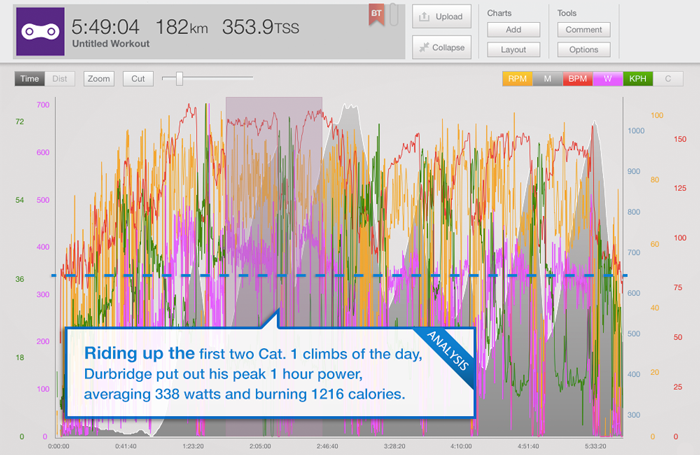 1 climbs of the day, Durbridge set his peak 1 hour power, averaging 338 watts and burning 1216 calories. During the final climb, Durbridge averaged 305 watts, 3.97w/kg. for 30 minutes, all at the end of a brutal day. Over the entire stage, Durbridge burned a total of 4906 calories! After putting out his peak 1 hour power of 333 watts, 4.60w/kg, Rogers went hard during the descent to the finish. He averaged 341 watts, 4.71w/kg, over 12′ while going downhill! Not all the action happened at the end. Rogers peak 1, 5, and 20 minute power values all occurred in the first hour of racing. He hit 691, 468, and 400 watts respectively. Burning through 4354 calories in 5 hours means that Rogers burned an average of 870 calories per hour! View Clarke’s full file here. 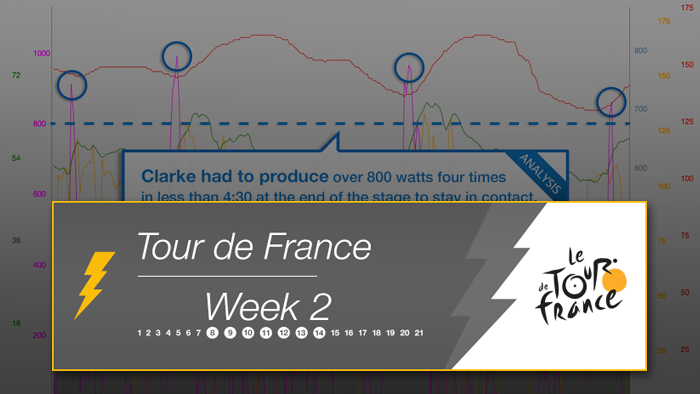 Clarke had to produce over 800 watts four times in less than 4:30 at the end of the stage to stay in contact. His biggest effort of the four was 993 watts, or 16w/kg! To make it into the break at the start of the stage, Clarke had to produce his peak power values from 2 seconds to 20 minutes, burn 641 calories, and average 50.1kph (31mph). 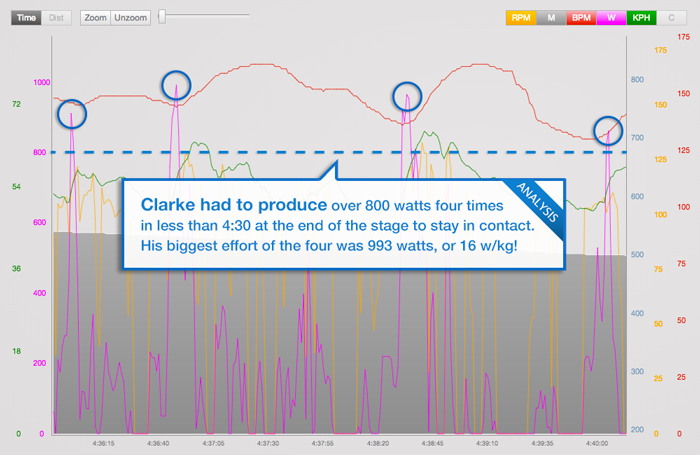 Over the entire stage, Clarke had a Normalized Power® of 261 watts, or 3.61w/kg. He also burned 3953 calories and had an average cadence of 95. 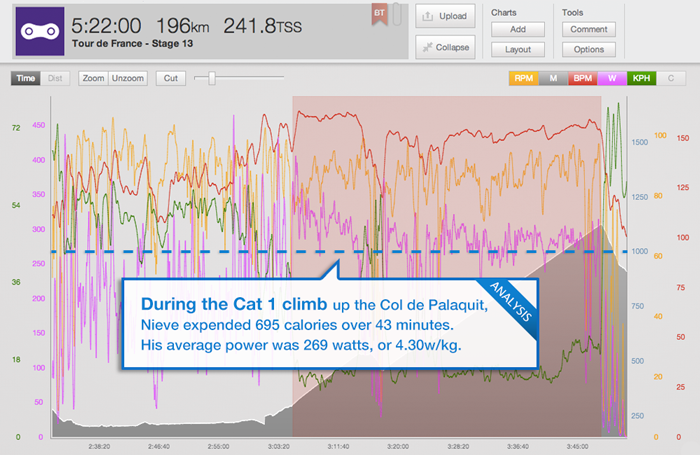 During the Cat 1 climb up the Col de Palaquit, Nieve expended 695 calories over 43 minutes. His average power was 269 watts, or 4.30w/kg. Not surprisingly, Nieve set his peak 5 minute power at the end while starting the climb up the Chamrousse. He held 355 watts, 5.73w/kg., at an average cadence of 86. In total, Nieve climbed 3606m (10,800ft.) over this 197.5km (122mile) stage. View Morkov’s full file here. 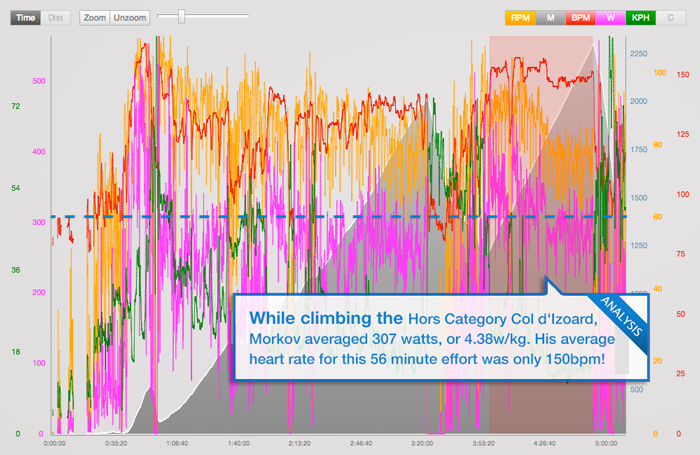 While climbing the Hors Category Col d’Izoard, Morkov averaged 307 watts, or 4.38w/kg. His average heart rate for this 56 minute effort was only 150bpm! On the final climb of the day, Morkov stil had to dig deep and averaged 268 watts at a relatively low cadence of only 76. Over the course of this six hour day in the saddle, Morkov burned 4987 calories. With the wind and rain, this was no easy day for Rogers. 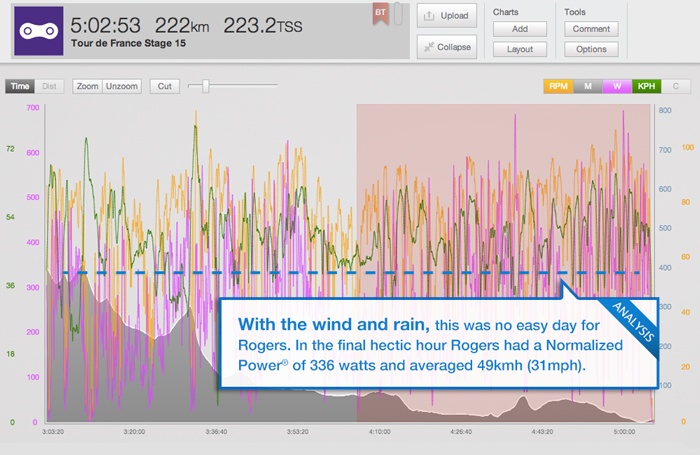 In the final hectic hour Rogers had a Normalized Power® of 336 watts and averaged 49kmh (31mph). Over the entire stage Rogers burned an average of 800 calories per hour! 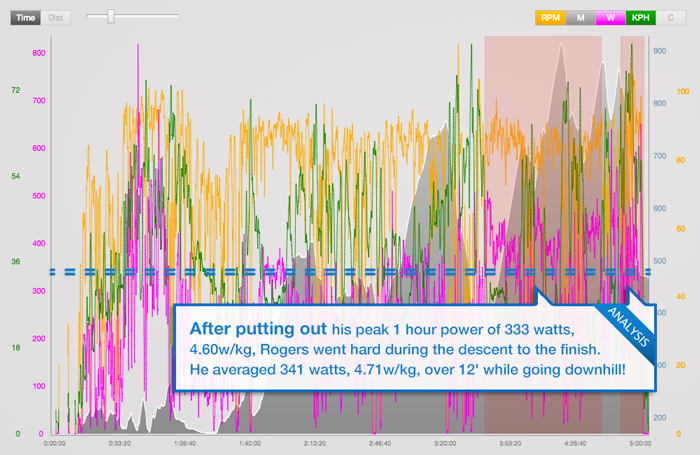 Rogers’ peak 30 second power of 634 watts, 8.76w/kg, was set with just 5km (3miles) to go. That’s a big effort at the end of a long stage. View power analysis from week 1 and week 3.